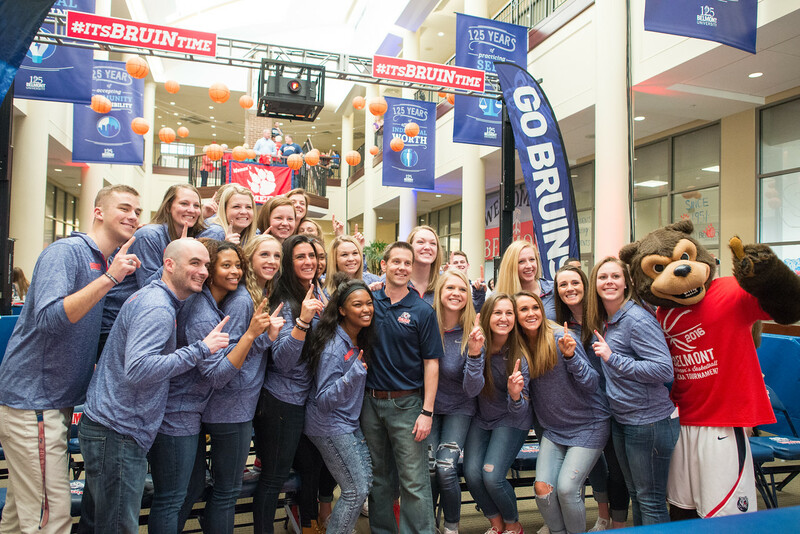 When Belmont Women’s Basketball Head Coach Cameron Newbauer uses those words to describe his young team, he’s not glibly repeating some common sports cliches. Rather, he speaks with an emotion-tinged voice, one edged with pride in the student-athletes, trainers, grad assistants and coaches he’s worked and traveled with over the past 10 months. It’s been quite a ride. Though Newbauer’s first two seasons led to a conference record of 21-13 and back-to-back appearances in the OVC tournament, the source of even greater pride was the team’s classroom excellence (returning to the Academic Top-25 team honor roll after a nine season absence) and monthly commitment to community service. 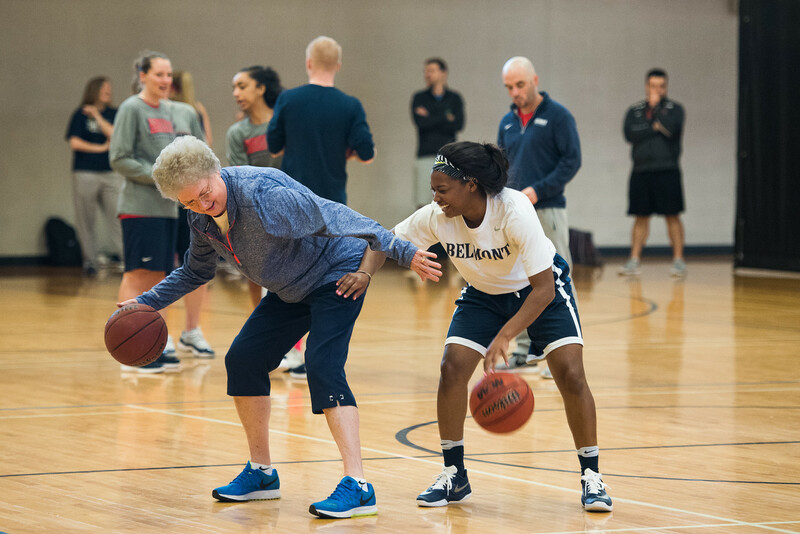 A mission trip to Rio de Janeiro helped cement relationships within the team that had taken root over the summer, and spending time with the legendary Betty Wiseman, the retired former Senior Women’s Administrator for Belmont Athletics who co-led the trip, inspired the team to think even more deeply about issues of faith and relationships. Somewhat of a patron saint of the women’s basketball program, Wiseman can be seen on the sidelines of nearly every game and has become a surrogate family member for Newbauer, his wife Sarah and their 20-month-old daughter Chloe. This team didn’t just adopt that mentality; they lived and breathed it all season, from their service in Rio to fall practices to the start of a season that saw them begin non-conference play with a surprising 8-1 record that included wins over University of Alabama at Birmingham, Troy and Wake Forest. But then came the test. A six-game road stretch brought six straight losses. Could this team bounce back? Could they persevere over such a difficult run? After preaching resolve, resilience and character all year, could this team reflect what they were hearing every day in practice? The women not only bounced back, they soared, winning 13 of their last 14 games of the season with the one loss coming by a mere two points on the road at UT Martin. 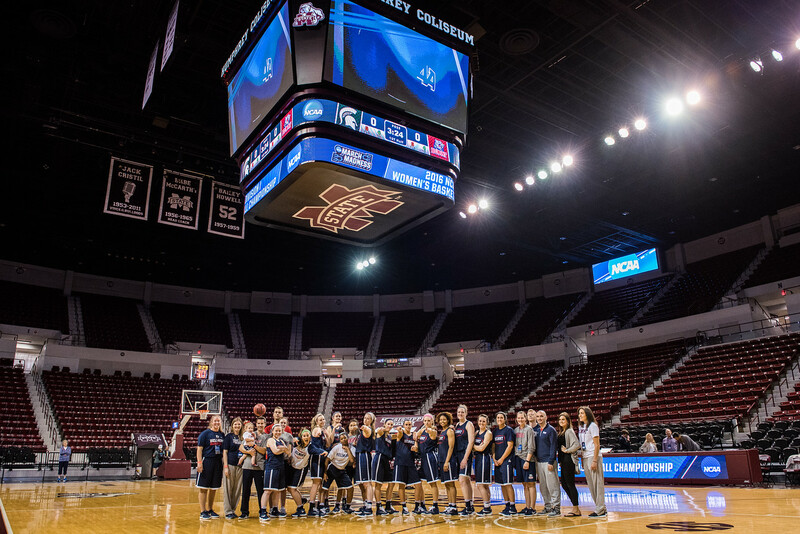 The momentum swept the Bruins into the second seed in the OVC Tournament, and the team dominated in three consecutive games, winning by 8, 24 and 32 points, respectively. 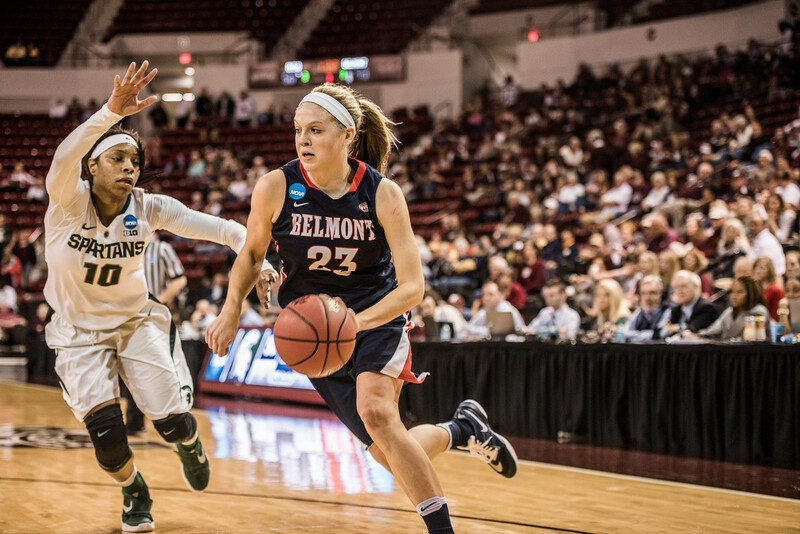 For the first time since 2007, Belmont women’s basketball was going to the Big Dance! Selection Monday revealed that the Bruins had secured a 13 seed and would take on 4-seed Michigan State in the first round, to be played in Starkville, Mississippi. Discovering their opponent just before 7 p.m. Monday evening March 14, coaches convened to study film of the Spartans until 4:30 a.m. Tuesday morning. They were back at work just over three hours later, ready to share a game plan with their players. It would be a mammoth undertaking, as Michigan State boasted one of the best players in the nation in Aerial Powers, who is considering giving up her senior season to join the WNBA. Like the season itself, the first-round game exceeded expectations and gave the nationally ranked Spartans a scare as the underdog Bruins proved they belonged among the country’s top teams, keeping the score close for three quarters. Though a quick burst of points to start the fourth quarter ultimately became more than Belmont could overcome, it was clear to all that this was a statement game, and a statement season, for the Bruins. A new era was beginning. After the game and required media interviews, the players filed out of the locker room to board the bus, finding their families waiting outside to hug the daughters, sisters and friends who had made them so proud. It was a fitting ending, since “family” was a key theme throughout 2015-16 and was on display throughout the NCAA trip. 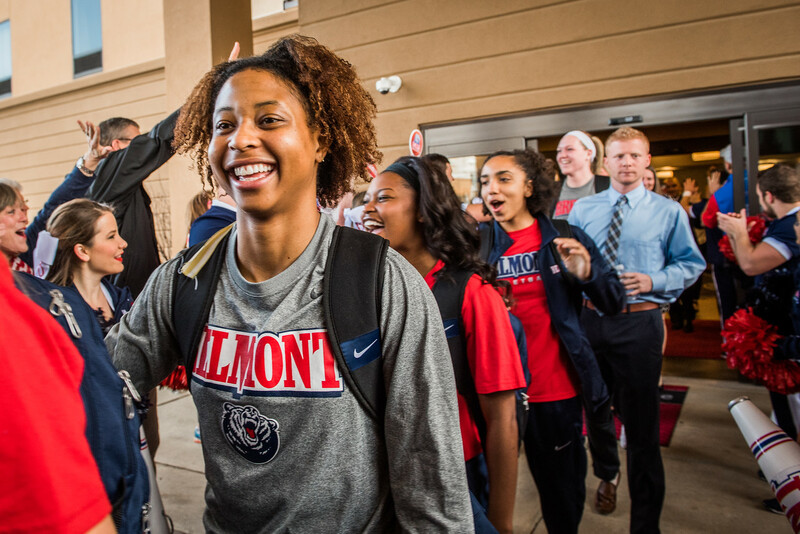 It was heard from the first moments on the bus departing campus for Mississippi as long-time bus driver Bob expressed his excitement in the team’s gift to him, a new Belmont Women’s Basketball shirt, his voice cracking as he told the women how proud he was of their accomplishments. It was visible in the Jim N’ Nick’s parking lot in Alabama, where the Bruins rehearsed their dance moves for the Battle of the Bruins fundraiser, an event they would win the following week. It was clear as players encouraged each other, watching management videos in a Hampton Inn elevator, before taking a test at 8 p.m. the night before the biggest game of their season. It was seen on TV as baby Chloe Newbauer held up her finger to signal her No. 1 team as mom Sarah, eight months pregnant with her second child, cheered on her husband. 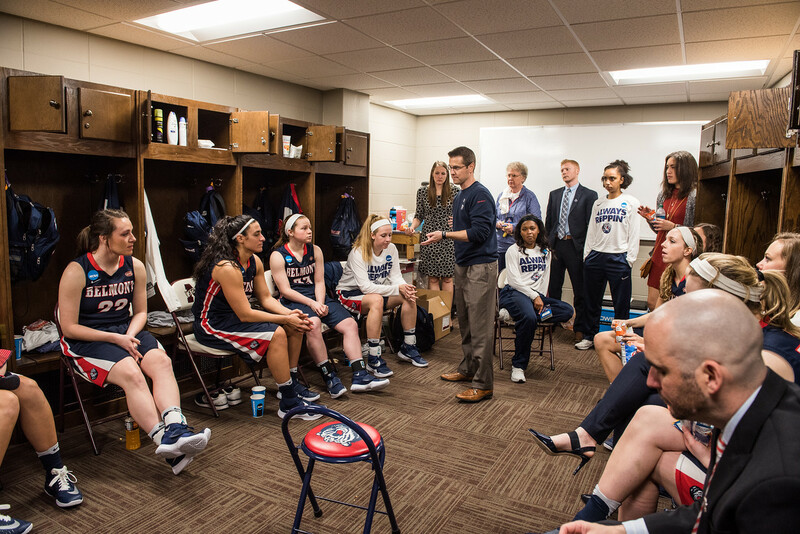 And it was evident in the bus ride back to Nashville as players gathered around an iPhone to FaceTime with Assistant Coach Carley Kuhn’s daughter Carsten. From the head coach to new recruits, the mantra rings true… resolve… resilience… character… faith… family. These are the qualities that count, and these are the attributes that lead to success on and off the court. 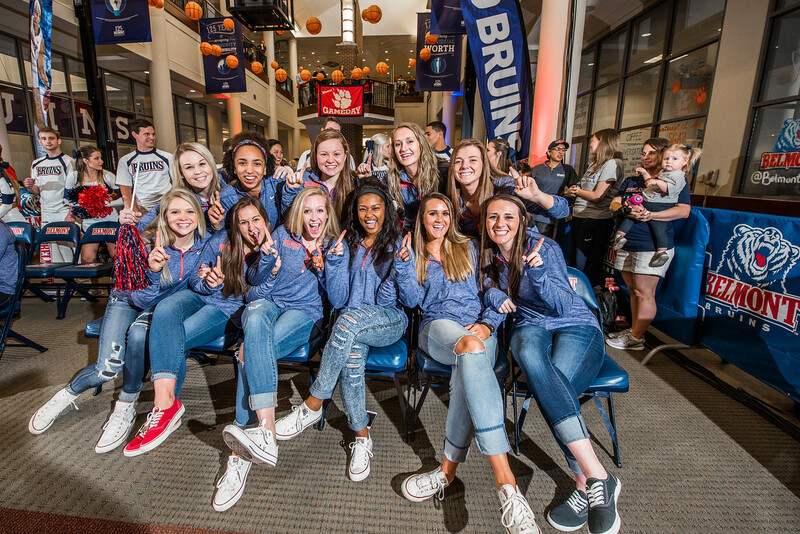 For photos from throughout the Bruins 2016 NCAA Tournament experience, click here.